City life can be unruly. People need to relax and have fun. They go to the city to eat large meals, drink alcohol, jump around in crowded places and listen to music that could damage their eardrums. Sometimes fun is confused with excess and, inevitably, there are consequences. Arguments and violence occur and the collateral damage from a too long Saturday can be long lasting for the individuals. These accidents repeat themselves and are one of the reasons we have a standing police force. The State believes it should have order in the streets, or something that serves as a reasonable imitation. Inevitably, there is money to be made from excess. In England, the city of Manchester adopted all night drinking well before the other cities. The police had more of a mess to clean up in the early hours but extra money arrived for local businessmen. We tolerate the individual accidents that happen and assume that only the determined repeat the accidents. Most will learn as they grow older although there will be a few that will regret the permanent physical or emotional scars. Unruly behaviour is often proclaimed to represent freedom. The tourist leaflets describe a lively city centre as ‘vibrant’. For the residents, it appears monotonous rather than exciting. But accidents that are destined to repeat themselves depend on monotony. Not that the residents are entirely without sympathy. The odd truculent youth whose desperate social skills have been rewarded with an iron bar across his head receives attention. It is why we have Accident and Emergency Units. It probably happened to someone this weekend in your city and even if you have escaped to a more prosperous market town in the Cotswolds you will have similar tales. Always, we move on to the next weekend. Disasters are different. Admittedly, the human race is intent on ignoring climate change and is ready to risk a future with weekly tsunamis but the psychologists tell us that is different. We cannot worry about events so far in the future. Disasters, though, are bad for you. These are not supposed to repeat. There have been plenty of warnings from apocalyptic movies. Disasters produce unclean men with shabby clothes, beards, damaged vocal chords and terrible haircuts. Less than a month ago, in Santa Maria in Brazil, 253 people died in a nightclub called ‘Kiss’. What followed was predictable. President Dilma Rousseff visited and shared grief with the relatives of the deceased. Many appeared on television. They were bewildered and heartbroken. An investigation has revealed inadequate safety procedures. The fire certificate of the club had recently lapsed although there is no evidence that the owners of ‘Kiss’ would not have secured another safety certificate. All the owners had to do was remember. Brazilian politicians have pledged that this will never happen again. evening. Maybe we learn a little because, since then, Bob Dylan has not asked anybody to light their cigarette lighters at any of his concerts. What happened to his live album with the cover showing all the lit flames in the audience? And this is the cleverest man in rock and roll. 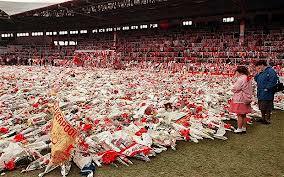 The Hillsborough disaster, when 96 Liverpool fans died, led to British football grounds being revamped as ‘all-seater’ stadia but the cynical have always believed that it was mere financial opportunism and had little to do with human life. These cynics allege that the authorities are indifferent about damage. Well, for a long time they were certainly casual about what the police did that day. What appears important is that the streets do not threaten chaos. Riots and not disasters produce the dramatic government response. 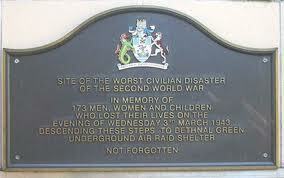 On March 3 1943, on an evening typical of the Blitz, a crowd entered Bethnal Green underground station to escape the bombs. A few hundred yards away an anti-aircraft battery exploded into action. The guns made an unfamiliar sound and the crowd became nervous. A woman tripped on the stairs and others fell. 173 died in the subsequent crush and panic. 30 people were crushed to death on the stairwell. The victims are now remembered with a plaque. This appeared in 1993. The disaster produced more British civilian casualties than any other incident in the Second World War. Newspapers were allowed to report the tragedy when it occurred but were prohibited from naming the station. Historians have made the normal enquiries and the usual suspects have emerged – poor lighting, lack of a crash barrier, poor supervision by the police and inadequately trained air raid wardens. Supposedly, the anti-aircraft battery should not have been situated in a highly populated area because it produced a terrifying noise and scattered shells. If guilt existed in the authorities, its only manifestation has been a plaque that appeared nearly 50 years later. Fortunately, there is now a very impressive Stairway To Heaven Memorial Trust and they are creating a suitable monument. This week, Barack Obama, pleaded with Congress to vote for a debate on gun control. Since the Columbine disaster, there has hardly been an academic year without a schoolyard slaying. Stone-faced Republicans listened to Obama. The images were memorable and at this point in history they probably need no comment. The self-interested phonies had been found out and knew it. But, though we hate disasters repeating themselves, nobody would bet against the Republicans prevailing, simply because they lack shame. The poor in Brazil feel the same about their rich, that like the Republicans they are unable to feel concern for ordinary people. the nightclub is in a prison hospital. He and two members of the band have been charged. The owner tried to kill himself while in hospital. He is permanently handcuffed to the bed, a man who ‘no longer has the will to live’. The band playing at ‘Kiss’ had an accordionist and he died. I do not know why but the accordion makes it more poignant. The band has been condemned but hard as I try it is difficult to imagine an accordionist as reckless and destructive. But who knows? It is been alleged that the security guards stopped people from leaving. Some of the victims were trapped in the toilets. This would have been a night when a bloke carrying an accordion would have had few friends. After the disaster, the country observed 3 days of mourning. 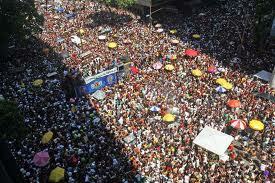 But this week in Rio de Janeiro, the Cordao de Bola Preta carnival began. The city expects 2 million visitors. Many of the residents will leave the city for rest and quiet. Few at the carnival will be thinking of the 253 who died in ‘Kiss’ in Santa Maria. They will want fun and excitement. Unless we have a climatic disaster and all the men look and act like they do in the apocalyptic movies then the appeal of the crowd will persevere. The monotonous instincts that oblige residents to leave Rio will continue to create victims. The Cordao de Bola Preta is not the first carnival since the disaster. The city of Santos had its February carnival days before the Cordao de Bola Preta. A float caught fire and four people died. If you want to read about the Stairway To Heaven Memorial trust click here. Life goes on the world keeps turning, but we must learn from our mistakes or be condemned to repeat them. Thanks for the comment. See that you had some success in the football. A cleverly crafted yet sensitive piece which again highlights that human beings are either very naive or arrogant. I suspect the latter. Such a shame with these disasters and hopefully no more disasters like these will happen again, but maybe that is wishful thinking. Rest in Peace to all the people who lost their lives in said awful and unfortunate events and my thoughts and well wishes go out to their families. Thank you Howard for the great article, as always, very informative.